Elmo continued the tradition of celebrating the 4th of July on the last Saturday in June with a day of festivities ending in a fireworks display enjoyed by many. Cousins of the Hull family were in the parade. They included, front: Maggie Miller, Kailyn Baller, Matthew Adkins; back: Grant Adkins and Katy Miller. 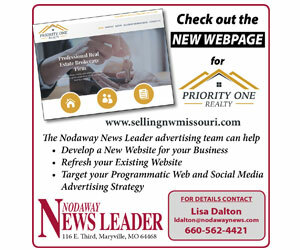 For more photos see the printed Nodaway News Leader.